Jazzyfaces Provides Fabulous, friendly and professional face painting for birthday children parties, weddings School fates corporate events and much more, Our face painters are trained professional artist who will insure your event runs stress free and is remembered for the rite reasons. 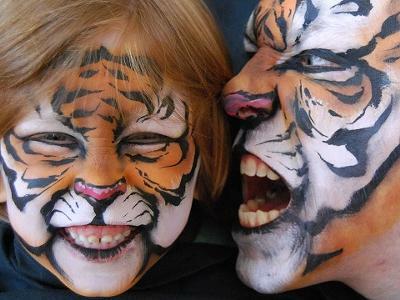 Face painting is one of the most popular activities at any fun packed event, and it's not only for children! Whatever the event, large or small, from children's parties to family entertainment and corporate events. Face painting is creative fun for all ages. We offer a wide range of designs from beautiful butterflies and fairy princesses to roaring tigers, super heroes and cheeky dogs. 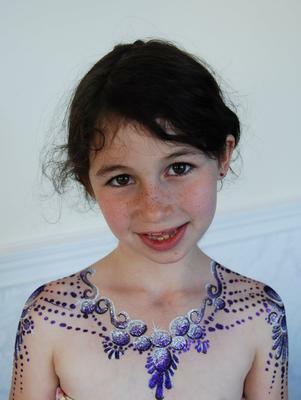 We like to tailor our designs to suit the individual who is being painted, this way we can ensure happy faces all round. We only use the highest quality paints, EU and FDA approved products, all paints are water based and can be removed with water or wet wipes. All our face painters have their own public liability insurance and Jazzyfaces can provide artist who are CRB checked and hold 5 million in Public Liability Insurance. 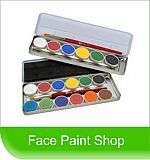 Face painting is ideal for Birthday parties (children and adults), family fun, store openings, company fun days, exhibitions, commercial promotions, themed events, balls, hen parties, carnivals, fund raising charity events, fetes, weddings, night clubs, fun fairs, teddy bear picnics and theme parks. Join in and write your own page! It's easy to do. How? Simply click here to return to Artists (Face Painting or Body Art).